RHIC is the world's only machine capable of colliding high-energy beams of polarized protons, and is a unique tool for exploring the puzzle of the proton's 'missing' spin. In addition to colliding heavy ions, RHIC is able to collide single protons. While these collisions don't produce quark-gluon plasma, they're interesting to physicists for other reasons. Scientists want to know more about a property of particles called 'spin'. Spin is the direction a particle is spinning around an axis as it travels -- just like the Earth spins on its axis as it travels around the sun. Each proton has a specific spin, which helps give it a characteristic magnetic property. In this picture of a proton-proton collision, the spin of the particles is shown as arrows circling the spherical particles. The red and green particles represent reaction products from the collision which will be "seen" and analyzed by RHIC detectors. Proton beams in RHIC are "spin polarized", meaning that all the protons in a given beam are spinning in the same direction. RHIC is the first machine in the world with the capability to collide such beams head-on. Why is proton spin important to understand? Astronomers studying the universe use proton spin and magnetism as important measuring properties. Spin is also what allows doctors to use an MRI (Magnetic Resonance Imaging) machine to see inside the human body to diagnose disease. For these reasons and others, physicists want to measure and understand how different factors influence a proton's spin. Experiments elsewhere have shown that the spins of the proton's constituent quarks (and antiquarks), in some cases accounts for only about 30% of its total spin. RHIC spin experiments are providing the first information on how much the spin of gluons contributes to the proton's spin, a contribution which recent theoretical work suggests may be large. If the quark and gluon spins together still do not account for the proton's spin, the only remaining source available to "balance the books" is the movement of quarks and gluons relative to one another. Thus, RHIC's measurements of the spin substructure of the proton may lead us beyond our current, still rudimentary understanding of how quarks move inside protons and other particles. Keeping particle beams polarized as they make their way through the chain of five accelerators that make up the RHIC complex is very difficult. 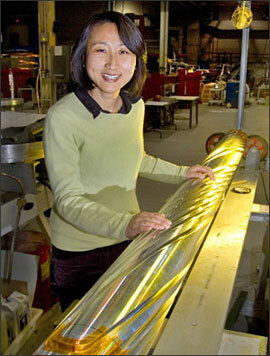 Specialized sets of magnets called "Siberian snakes" (physicist Mei Bai is shown with one, above) are used to minimize polarization loss. The magnets' corkscrew-like design causes the direction of the magnetic field to spiral along the direction of the beam. As the beam moves through the two snakes in each of RHIC's 2.4-mile-circumference rings, the magnetic field flips the polarization, or direction of spin, and averages out many smaller effects of RHIC's magnets, which otherwise would depolarize the proton beams.